How often do you see a bird flying high in the sky and wonder where it’s going? Some birds make amazing migrations of many 1000s of miles – how long has that bird already been flying? How much farther does it have to go? 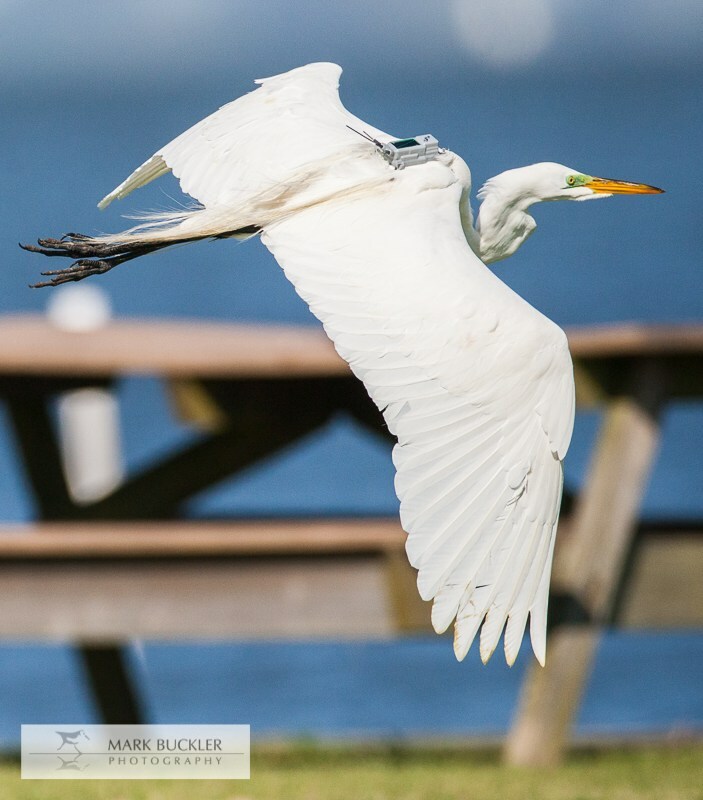 Migratory birds must have amazing stories to tell, but we are left to imagine the details as we watch them fly overhead. 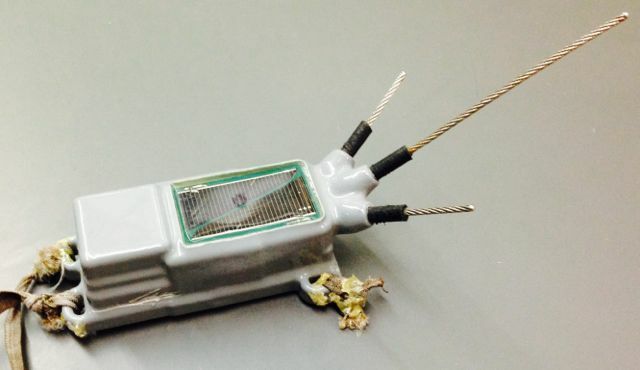 Modern technology is now revealing these stories in amazing detail – new tracking tags use GPS to record location and a 3-axis accelerometer (ACC) to record their behavior. These solar powered units work 24/7, anywhere on the globe, for the entire lifetime of an animal. Here I want to show you one example through the life and death of Mr. Bisbing. “Mr. Bisbing” was a male Great Egret. He was a slender, good-looking guy of average size and, as we found out later, he was in a productive relationship. 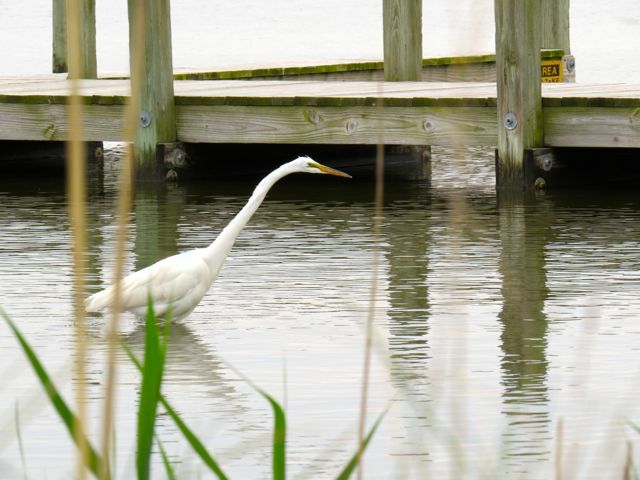 We met our protagonist at the Whalehead Club in Corolla, North Carolina, where we lured him into our traps with bird decoys and a bucket of fish (more in this Untamed Science video). Figure 1. Mr. Bisbing, calmly foraging, just before we caught him. Once we had him in our hands we gave him a high-tech backpack a GPS and ACC tag (Figure 2). We released him on April 21st , 2013 at 11:40am, in front of the Outer Banks Center for Wildlife Education, and followed his every movement for the next seven and a half months, until his untimely death. Figure 2. Mr. Bisbing’s tracking tag with GPS, ACC, and solar unit (weight: 48 grams, 1.7 oz). Figure 3a. Mr. Bisbing’s first steps after we attached the tag to his back. Figure 3b. Mr. Bisbing’s take off after we attached the tag to his back. We immediately learned an important part of Mr. Bisbing’s story: he had a nest on Monkey Island. The GPS data showed us that he went there every night. There’s a known egret colony there, and our tagged bird was obviously a member of this group. 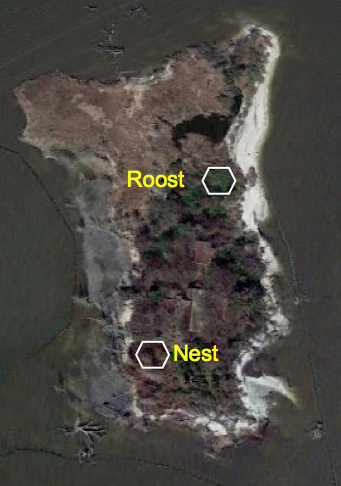 Looking very carefully at the GPS data we realized that he used two different parts of this small island: one spot on the south that was his nest and another spot to the north where he must have gone when he needed to get out of the house (Figure 4). Figure 4. Monkey Island with Mr. Bisbing’s nest and roost site. The ACC sensor records 3 dimensional movement of the bird that we can use to learn about the behavior of the bird. The graph below (figure 5) shows three lines describing the bird’s movements in three dimensions: up and down (blue), forward and backward (green) and right-left sway (red). Different behaviors of the bird create patterns that we can identify. In the resting position, all lines are flat. 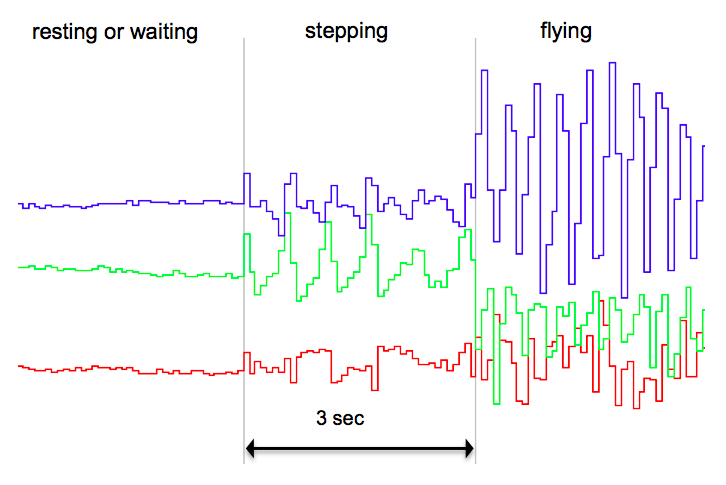 When an animal is walking, each foot-step creates a similar, but slightly delayed pattern in the blue and green. The wing-beats of a flying bird show the strongest peaks in blue. The ACC data are recorded in high resolution every 4 minutes, for 4 seconds at a time. Figure 5. ACC graph with example patterns for three different behaviors. The following graph shows you what Mr. Bisbing’s typical day looked like (Figure 6). Early in the morning, before dawn, he freshens up and goes for breakfast. In this example (May 24th) the GPS shows that he flies from his nest on Monkey Island 3.7 km (2.3 miles) to the wetlands west of Corolla. In the ACC data you can see from the width of the blue high amplitude peaks that the early morning flight away from Monkey Island and the evening flight back to Monkey Island take longer than the short flights around the wetlands during his foraging behavior. The sleeping position during the night is also easy to recognize because the bird is motionless. Figure 6. 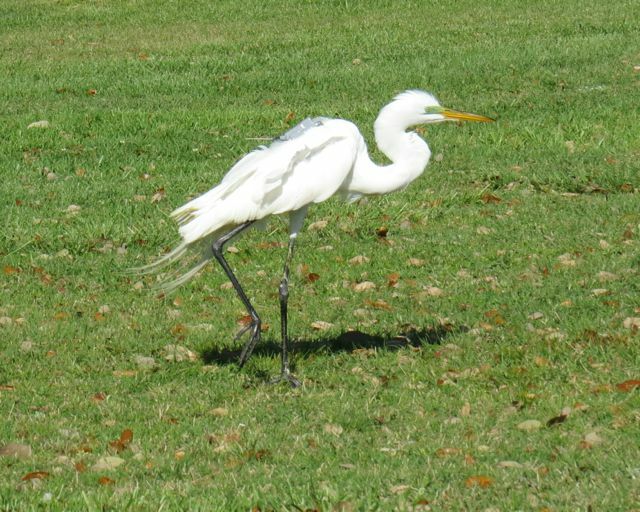 Typical egret day recorded by ACC data. Background in gray shows nighttime. Now you have met our main character and know the cool things this technology can tell us about his life. In my next post I’ll dive into the details of family life on the Outer Banks.